Conflict and crisis have left an unprecedented 22.5 million people living in exile today. The sheer number of people seeking international protection and the capacity of host countries to cope with the numbers are changing the conversation around how the international community should respond. As outlined in the New York Declaration for Refugees and Migrants—a set of commitments to enhance the protection of refugees and migrants unanimously adopted at the U.N. General Assembly last year—new approaches are needed to reflect the long-term displacement of refugees, particularly in low- and middle-income countries. These efforts must address the immediate humanitarian needs of new arrivals while also incorporating and reflecting the long-term needs of both refugees and host communities. 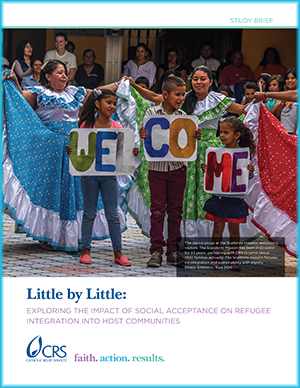 To better understand how local integration plays out within communities, particularly the process of social integration, CRS has undertaken a three-country qualitative study in Ecuador, India and Jordan. This study strongly suggests that social acceptance is an integral component of a refugee’s integration process and thus should be prioritized in programming and policy development. Promoting social integration can facilitate access to other components of the integration process, such as housing and employment, and potentially improve other outcomes, such as mental health. Given that almost 75 percent of refugees are displaced for more than 5 years (UNHCR, 2012), policymakers and practitioners must respond with an approach that supports integral human development in addition to addressing immediate humanitarian needs. Fund and pursue programs that support and serve refugees through an inclusive and holistic model, rather than sectoral responses. Identify beneficiaries based on vulnerability, and include necessary support to host communities. Donors should remove nationality-specific restrictions on funds directed toward refugees living outside camps, and support communities by focusing on vulnerability. Develop education campaigns centered on refugee experiences to prevent ongoing misinformation and misconceptions about refugees. Educating community members about the realities of refugees’ lives can help counter stereotypes, xenophobia and perceptions of competition between groups. Incorporate the use of shared community spaces into programs. Programming that addresses communitywide needs should be provided in ways that intentionally facilitate and promote social engagement. More interactions may help communities view refugees as individuals rather than threats. Sensitize host communities to refugees’ struggles. National and local governments should work to educate host communities on refugees’ experiences and actively promote positive social interactions among members of both communities. Establish standardized refugee policies and regulations that reflect international norms. Countries should develop policies that reflect international protection norms and apply them to refugees regardless of nationality, thus reducing the politicization of refugee assistance. Ensure service providers have the skills and knowledge to support refugees. Individual practitioners and administrators are gatekeepers to the various institutions that inform the concrete components of the refugee integration process, including access to medical care, education, and legal status, among others. All service providers should be trained on the legal rights and psychosocial needs of refugees to ensure they are equipped to perform their duties.